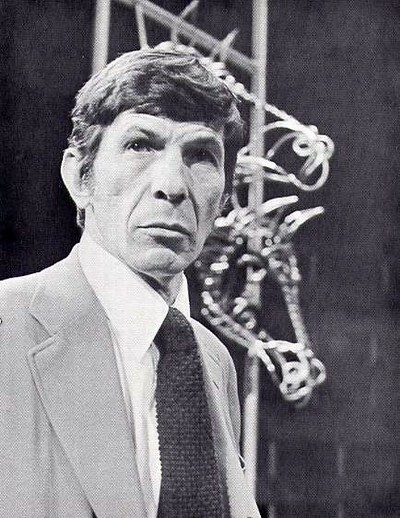 I had a chance, in 1978 to see Leonard Nimoy perform as Dr. Martin Dysart, the psychiatrist in the play Equus. As a NYU grad student, I was eligible for special seating for students at a reduced rate and a special location, i.e. bleacher-type seats right on the stage. This was a great perspective to watch Nimoy perform. He did a wonderful job but you could sense how he struggled to ensure his character did not come across as a variation of Mr. Spock. This might be difficult to appreciate now, but in the late 70’s Star Trek conventions were all the rage and the series was going through a bit of a revival. Even now, Mr. Nimoy seems to be remembered solely for his Spock characterization. However, like Riggan (Birdman), over the last few years Leonard Nimoy seems to have accepted his place in history as having created one the greatest SciFi characters of all time. Live long and prosper, you shall Mr. Nimoy! This entry was posted in television and tagged Leonard Nimoy, Mr. Spock, Nimoy, special seating. Bookmark the permalink. I had the honor of touring with Leonard in ‘Vincent’. Every performance, he was Vincent and Theo VanGogh, never Mr. Spock.Leonard was a very talented actor, as well as a wonderful person.